We caught up with Steve Gaynor to talk about the success of Gone Home, its delayed console release, what’s new in Tacoma, and why it won’t be in VR. 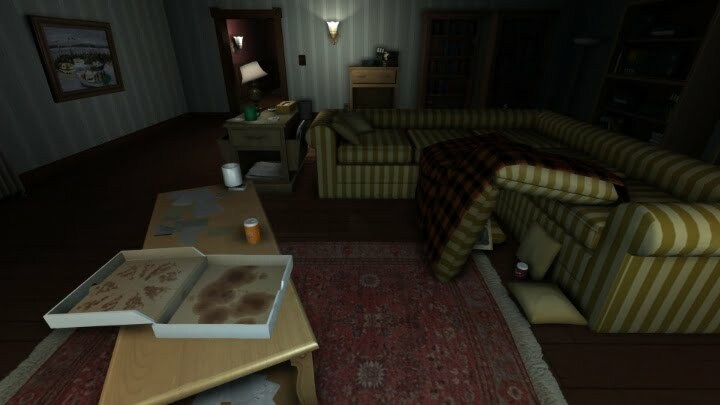 Last week the console versions of Gone Home launched for PS4 and Xbox One, but unfortunately, they didn’t launch everywhere. While the US releases unlocked on the day everyone expected, the European and Australian releases were nowhere to be seen, so Steve Gaynor of Fullbright took to Twitter to break the bad news that an issue with the ratings had caused a delay in the international releases. We already had an interview booked in with Mr Gaynor – lead designer and writer of Fullbright and formerly of 2K Games, with credits including BioShock 2 and the Minerva’s Den DLC – to talk about the success of Gone Home and the indie studio’s next title, Tacoma. But when I spoke with him, and after the initial greetings and pleasantries, I couldn’t resist the opportunity to find out exactly what’s gone wrong with the Gone Home console releases in Europe and Australia. Thumbsticks: I’ll get the difficult question out of the way first: what’s been going on with the certifications for the Gone Home console release this week? So we’re working on it now. We hope that it will be out in a matter of days or a week, not much more than that, but we’re not going to say anything specific until we’re all the way through like, “Yes, it’s through, now we’re doing it!” because you know, that’s no good. But we haven’t shipped a console game of our own before; we’ve worked on big console games at AAA studios in the past but it’s been a learning experience, and we appreciate everybody’s patience. Absolutely, and I don’t think there’s been any angst or rancour over it, I think it’s just been a surprise to the public that one side “worked” and the other one didn’t. I think that’s perhaps an indication of how well-loved Gone Home has been. Were you surprised at how successful the original release was? Yeah certainly, you know, we came along at a good time for the kind of game that we were making. We were inspired by games that had come out in the years leading up to ours, I mean anything from games like Dear Esther, Proteus and Thirty Flights of Loving and other non-violent first-person games like Amnesia – a first-person horror game, but still a non-combat first-person game – where you do most of the stuff you do in Gone Home; open drawers and cabinets, and find notes and sort of explore this place, and also run away from monsters! So all of those things, along with the success of games like World of Goo, Braid, Limbo and Bastion (by our friends over at SuperGiant) it all made us feel… it feels now like it was a very good time to put out something like Gone Home, where I think there was a ‘perfect storm’ of people being interested in this kind of game and this scale of game. We just tried to bring all the stuff we had learned from working on the BioShock series, and working on the Minerva’s Den DLC that I had been the lead on, to just make it the best version of the thing we were trying to make that it could be. We were just really lucky that we got a critical mass of people who were on board for what we were doing and connected with the story, and before we shipped we thought the game was good. We had played it and we were like, “I think if I played this, I would think it’s good,” and you know, that’s all you really want – but I think the degree to which it kind of took off was a big, pleasant surprise to all of us. Talking of some of those other projects there, the likes of Dear Esther and Amnesia, and following on from the success of those games (and Gone Home) it’s turning into a good few years for the narrative-driven, experiential storytelling game. Are you playing the other games out there, the likes of Sunset, Everybody’s Gone to the Rapture and Firewatch? Definitely yeah, I haven’t gotten… the jerks at Campo Santo haven’t sent me a copy of Firewatch yet, so I haven’t gotten to play it! What’s their problem? I’ve been friends with those guys for a long time, but I’m looking forward to playing the full game at release as I’ve only touched it a little bit. I mean I’ve certainly kept up with [Everybody’s Gone to the] Rapture and SOMA – the follow-up game from the creators of Amnesia – and I’m looking forward to The Witness when it comes out in a couple of weeks and Firewatch as well, and The Beginner’s Guide, follow-up from the creator of The Stanley Parable… so yeah, I think that it’s been a really interesting intervening few years since this – you could probably call it a sub-genre maybe – kind of started to take off. I’m really looking forward to games like Adr1ft; there are all these different games that I think are taking the basis of, “What if we took the shooting out of a first-person shooter? What else is compelling about the experience that grows out of that?” So we’re seeing all these different experiments of what that means and I think it’s just like, people are seeing the possibilities of exploring that space in a way that we haven’t seen before, which is awesome. I think from our point of view we’re seeing people who are a lot more interested in things that have a bit more to them than just violence and cut scenes, which is a really interesting sort of movement in the things that you see at trade shows. Now people are crowding around things like Firewatch, whereas once upon a time they would have been crowding around the most bombastic and most explosion-filled things. The Campo Santo founders have worked at Telltale on The Walking Dead series and I think even games like Telltale’s are just like another kind of branch; it’s another version of people looking for a game experience that isn’t necessarily about really deep numbers-based mechanics or twitch reflexes, and are looking for how a game can be about a story and being involved with it, and following it and driving it. I think that when you look at Telltale, the breakthrough that they had around that same time with The Walking Dead and what they’ve continued to do, and how the Campo Santo guys are pulling that forward into Firewatch with a first-person exploration game that also leverages the whole ‘you’re building a relationship with this other character through dialogue’ while you play. There’s just all these threads that are interweaving – like Life is Strange – and certainly it’s a sign that there’s an audience that says, “OK, I’m part of the audience that likes to play Fallout 4 and Bloodborne and Metal Gear Solid V,” and also is excited for stuff that’s exploring territory outside of that. 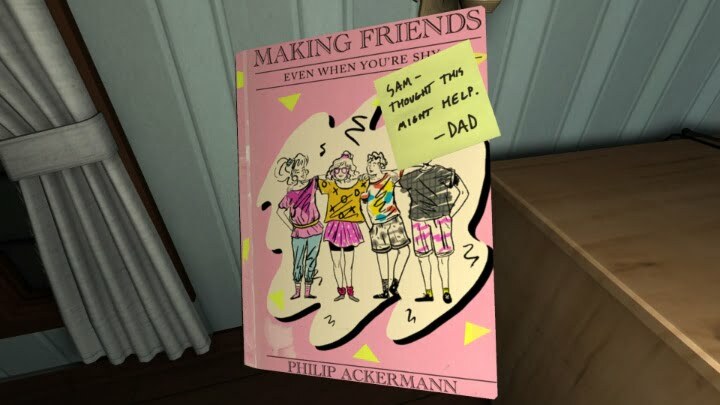 Coming back to Gone Home briefly then, were you always thinking you may do a console version of it, or was it only viable based on the PC success that you had in 2013? It’s been a long road and we use the Unity engine – more recent versions of the Unity engine have been a lot more viable on the new platforms than the stuff we had originally shipped the PC game on – so I think it was a question of, “Yeah, we want to set ourselves up for the possibility,” but we didn’t really start digging into it until after you said, we knew how it had been received on PC, and then there was a whole lot more between us and it actually coming out. As you guys in Europe know there’s still a little bit more before it comes out everywhere, but it’s really exciting that there’s people that are going on their Xbox One and their PlayStation 4, and downloading the game and playing it in that form. I feel like we had tons of people we knew, I knew when the game came out – and I take this as a huge complement – that when the game came out there were like, “I don’t really play PC games, I don’t have a Steam account, but people keep saying I’ve really got to play Gone Home so I took the leap and played Gone Home on PC, and it was one of the only PC games that I’ve actually played,” and I think there were a lot of other people that were like, “I only play games on my console of choice,” and so I’m excited to know that now people who just didn’t have access to it before can now jump in and check it out. It’s a good feeling. Earlier this year though, it looked as though it wasn’t going to happen at all; how far were you through the console versions when it happened, and what went on there? Basically we were working with a publisher to help us with submission and distribution, and they had some internal reshuffling stuff that went on [at the] end of last year, earlier this year. I’m not even really privy to exactly what it was, it was basically just they put the project on hold for a while and so we concentrated on Tacoma, we got on with things, and then the opportunity came to basically take it out of cold storage at the end of 2015. We brought the port in-house, we upgraded to Unity 5, we did the work ourselves and the publisher’s still helping us get it onto the platforms, but you know, I think it was time that we needed anyway? Because in the intervening time, like I mentioned, Unity 5 was released and then developed a lot over that time, and the engine being more and more tailored to the needs of the current gen platforms really made it possible for us to get it out in a way that we were happy with. It was one of those things where yeah, it would’ve been great to get it out earlier but I think that, end of the day, we’re really, really seeing the best version that we could have due to the delays and stuff that happened. Perhaps everything works out in the end in that respect? Hopefully! We’re certainly grateful that this is a PC game that came out two plus years ago and that people are still excited to play it, and that it hasn’t totally faded into obscurity in the meantime, so it’s certainly encouraging to see the reaction it’s getting. There can’t be many bigger compliments than that, I imagine. Yeah, certainly! I mean, there’s some amount of hubris I guess in this, but when we were working on Gone Home I was like, “I want to make a game that people will still feel is relevant and worth playing ten, twenty years from now.” I play games like that now, like I’ve picked up Deus Ex or Super Metroid or whatever you want to point out, certainly decades after they’ve come out, and not every game can be that. That’s the best you can hope for, but you know, I hope that on some level Gone Home is fairly timeless as far as these things go, so I’m certainly very grateful that people do still care at this point in time and hopefully, will continue to as we go forward. I think the relatable, domestic setting of Gone Home probably helps people in that regard as well, but Tacoma is obviously a long way removed from that. Where did the inspiration for Tacoma come from? Well we started out working on Tacoma as another game that was set in a very kind-of domestic setting, at a different point in time with different characters and all that. 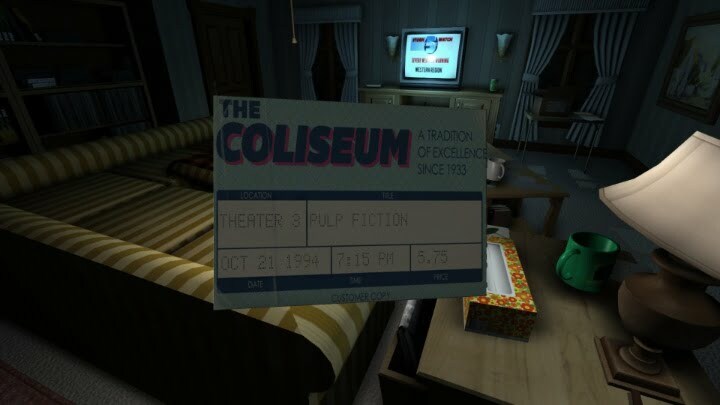 It was originally set in the town of Tacoma, WA which is why the game was originally called that, and at some point it was just like, we realised we couldn’t do that again right away. The next thing we did couldn’t be that close to what we had already done. Basically a space station was the idea we were the most excited about that also had all the qualities that we needed to make the kind of game that we wanted to and, over time, what we’ve discovered is that really more than anything the technology of the future, like digital technology – in the fiction of the game, of augmented reality and being able to see these digital echoes of what happened to the crew while it was happening to them and everything – that ended up being the thing that’s most valuable about the setting above and beyond it being in space, or it being a technological facility or whatever. I can’t argue with that logic! Have some of the aspects of the space setting been tricky to get right, things like the surface transfers and the specific feel of the microgravity when you’re manipulating objects, that sort of thing? Yeah I think so, definitely; that’s actually evolved since you saw it, since we showed it last, and I think we’re going to be showing more playable stuff. Obviously we’re going to be showing more stuff from the game later this year, I’m not sure exactly when, but when we come back I think there’s a lot of things that will have changed subtly, but in a way that’s important to the experience. One of them is that, as we went along, we were digging and seeing what the experience was trying to tell us effectively, and at some point we decided we wanted to try rebuilding the space station in the style of 2001: A Space Odyssey, or like the ship in the Martian – a centrifugal force, partially-gravitised station – and so now the way that it’s built at this point. It’s a hub and spoke system like that and the player has full access to floating freely in the central hub that’s completely zero gravity, and then transferring all the way out to one of the spokes and walking in artificial gravity, and living within how that system would work in a way that we hope speaks to the authenticity of what the experience might actually be like. I think that’s the thing that we really ran into, we were kind of walking a line between, “It’s kind of zero gravity… but you still walk around because you have magnetised boots, but you can transfer through the air but you can’t just float…” and it felt like it was not really saying to the player, “Here’s what it would be like,” it’s sort of saying to the player, “Deal with our weird line-straddling that we’re doing and try to figure out what our version of this is,” and once we tried, “What if we tried to build this station like an actual space station might be build for long term habitation?” it felt a lot better. We’re really excited to show people aspects of that, and also we’ve evolved the AR recording a lot and how you actually manipulate it and how expansive it is, so anyway – part of the process is kind of saying, “Here’s what we’ve got, here’s what we showed people, here’s what’s working, here’s what inspires us and what we want to push further and…” it’s going to be interesting to put it in front of people again later this year, and kind of see how things have moved along since we were last out in public. I think people were already excited by the concept and the setting and the look and feel of it already, so if you’ve been growing and expanding upon the ideas and – maybe as you say – releasing some of the constraints that you’d put on yourselves in the beginning, then perhaps it’s going to be a wider and more expansive experience? I hope so, it’s I think… part of the process is discovering what’s really important about what you’re putting on screen by actually prototyping it, and playing it, and trying to respond it it, and then the job is to figure out how we can make that as complete-feeling as possible, and make the player feel as involved with the aspects of what this game is really about. Sometimes that takes big changes, sometimes it’s just small, subtle changes, but it’s good to have the ability to actually react to those things because hopefully it ends up being a better experience as well. And thinking about some of the changes to the design of the station for changes in gravity, and some of the pre-existing features like the Augmented Reality interfaces and the sign-language inputs, it seems like it could be a perfect fit for a VR experience; has that come up yet for Tacoma? You know, not really. Honestly, I think that there’s still really big challenges to fully controlling an embodied character in virtual reality in a way that feels natural and feels native to the technology, and doesn’t feel tacked on and disorienting, and from my point of view you either have to go all-in on VR and really say, “We’re making a VR game, and it’s gonna be great for VR… and we’ll adapt that back into a non-VR setting if we’re going to do that,” but we’re really designing for PC and console using controls on a screen, just because that’s what we’ve decided to allocate our resources to. I don’t think we have anybody internally here who is obsessed with VR and a booster for, “We need to make a VR game!” and I think if you don’t have that internally then it’s not going to end up being what it should be for that platform. The other thing we’ve found is if you design a game without VR in mind and then try to shoe-horn it into VR, that’s not going to be the best version of the experience either; so we aren’t developing this game for VR from the outset which makes me assume that we’re not going to be adapting it to VR in the future. 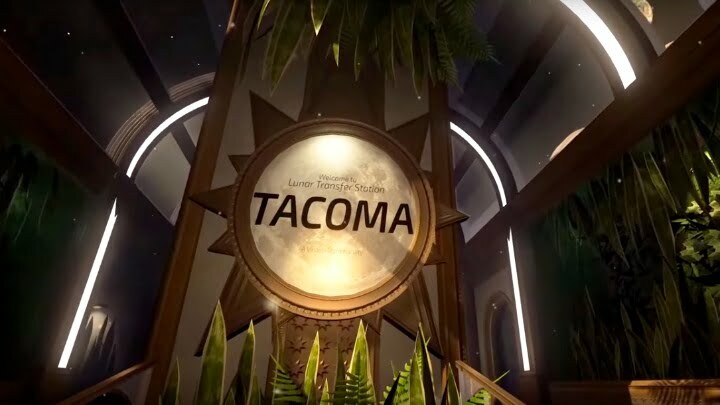 That said, we’re working with Microsoft for the release on Xbox One and Windows PC, and they’re doing the whole HoloLens thing and that’s really about augmented reality which is what the fiction of Tacoma is about, so there might be more interesting AR possibilities for Tacoma than VR, but I don’t really know. That’s a really interesting take on it. You said you’re going to be showing some new features of Tacoma later on this year; do you know when that’s going to be, what sort of shows that’s going to be at? No, I’m not really sure yet. We’re at the beginning of the year right now and we’ve got Tacoma slated for 2016… so there’s only so many months to work with! But we’re going to be figuring it out. Header image: Tacoma Poster by Rebecca Mock, available to purchase from the InPrnt store. Is the term Video game becoming restrictive?